Made of pottery. I bought it is part of a set from Thailand recently. 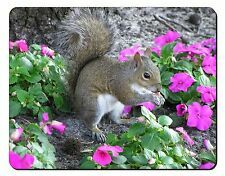 WITH SQUIRREL CHARM. DOUBLE SIDED CHARM. SIZE OF CHAIN WITH CHARM 7 CM. CHARM 2 CM X 2 CM. Made by Seba. Condition: Gleaming, fine. I bought it is part of a set from Thailand recently. The tail is also dark and light grey with a almost white colour on the end to show texture. Cute and quirky cheeky squirrel asking for food! 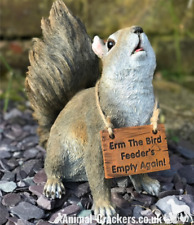 Removable 'Erm The bird Feeder's Empty Again' sign. Will add a lovely feature to any garden or back yard. The second is a Dartington Capredoni which is also signed. It is 2.25" tall and 0.75" deep. The first is a Mats Jonasson handmade in Sweden and signed. It is 4.5" tall and 1.5" deep. This is two glass crystal paperweights both depicting squirrels. ULTRA REALISTIC. Very realistic and a great talking point. BY VIVID ARTS. LIFE SIZE RED. All things can usually be settled with friendly communication. I bought it is part of a set from Thailand recently. The tail is also dark and light brown with a creamy colour on the end in to show texture. Royal Doulton St Tiggywinkles. Sarah Squirrel. This is a very happy squirrel. She's managed to find a whole pile of new books to read and she's looking forward to settling down with them later! She's made from resin, and is happy indoors or outside all year round. SQUIRREL FABRIC BOOKMARK. 100 % COTTON FABRIC. EACH ONE UNIQUE. SIZE APPROX 19 X 7 CM. 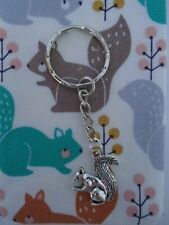 925 Sterling Silver Squirrel Figure. Woodland Animals. A detailed and attractive 925 Sterling Silver Squirrel. 925 Sterling Silver. Beautifully crafted in 925 Sterling Silver with has a highly polished finish. Kitten Heels. Design /Print: A Gorgeous Red Squirrel in the Snow…. Snow Globes. The Reynard Estate Fox. Christmas Baubles. Christmas Collectables. Newborn Baby to Toddler Gifts. Bottle Opener. SQUIRREL BOOK MARK. GREAT GIFT IDEA FOR SQUIRREL LOVERS. SILVER PLATED. Bradley & Hubbard Squirrel With Nut Doorstop. HAND FINISHED METAL SQUIRREL ORNAMENT. WITH TAG AND STICKER ON BOTTOM. PLEASE CLICK ON - READ MORE - PAGE WHERE THERE ARE MORE DETAILS AND PICTURES. do read the description thoroughly, view each photograph with care and please take note of the measurements, photographs can be deceiving making items appear larger or smaller than they actually are including sight deviations in colour due to monitor settings and light. SUPER VINTAGE PIETRA DURA MICRO MOSAIC OPAL & SILVER SQUIRREL PENDANT & NECKLACE. This unique image is painted by myself, then printed and hand finished by us in our studio to the very highest standard. It is a 10" x 8"/approx. 20cms x 25cms print mounted on 6mm board in a rustic style. QUAIL CERAMICS SQUASH THE GINGER CAT MONEYBOX. Schleich Eurasian red squirrel eating (14684) in very good condition (see photos). 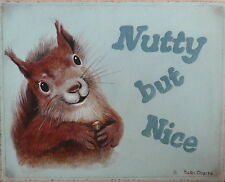 Framed & Glazed Red Squirrel on Plant Pot D A Blackmore Print 14.75" x 11.75"
D A Blackmore Print. Display stand not included. Silver Coloured Oval Squirrel Dish for Nuts, Sweets, Cufflinks, Keys, change. Please see photos and ask any questions. Very sweet bushy tailed squirrel ornament. Suitable for indoor and outdoor use. Constructed from a high grade of resin. Fashioned in the style of carved, whittled wood. 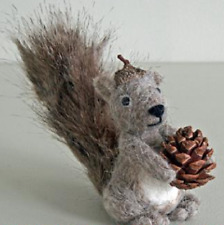 The squirrel has a cheerful expression, holding onto a pine cone. Great addition to the home, garden or a lovely gift for someone that is a fan of nature. Measures approx 13cm x 7cm x 12cm ( 5" x 3" x 5"). .
Lovely quality red squirrel salt and pepper shakers from ceramic designers quail. These little red squirrels are each holding a little nut and have a plastic stopper in the base of each one. A charming hand-carved red squirrel in a beautiful, well-featured piece of Scottish yew. Squirrels decorative plate Susan Beresford 6 ins diameter Decorative collector plate depicting the Wildlife of Britain this one SQUIRRELS specially designed for Readers Digest by Susan Beresford. 6 ins diameter 0.75 ins deep gilt rim and multi-colour image depicting an otter family. No damage for decorative purposes only. Lovely collectable. A cast solid resin bronzed sculpture wth makers label to base. Minor marks to base. 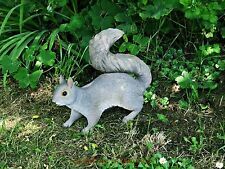 A beautiful Fair Trade wooden Garden Squirrel Statue. Hand-crafted in Indonesia using Parasite Wood. By cutting away the Parasite the tree is able to live a healthy Parasite free life. Sizes are approximate. WILD RED SQUIRREL. MOUNTED PROFESSIONALLY IN WHITE MOUNT BOARD AND THEN BACKED. This Sculpture is Stunning, it is a wonderful RED SQUIRREL AND HER BEAUTIFUL FAMILY IN A WOODLAND SETTING BY AN OLD TREE STUMP HOLDING ACORNS IN THEIR DELICATE PAWS. This is A Magnificent Piece. The sculpting of this piece is wonderful. Vtg Tactile Lead Crystal Signed Glass Squirrel Princess House PH Czech Republic with original label. GOOD LUCK. Adorable wood effect Squirrel sat eating acorn, with beautiful big brown eyes. 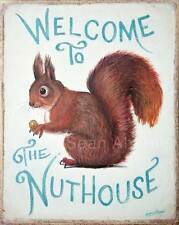 Great gift for any Squirrel or wildlife lover! 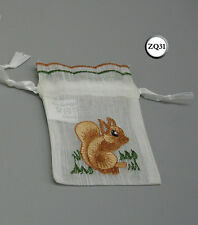 Squirrel height 25cm (9 3/4 "), width 30cm (12") approx. Will add a touch of wildlife to your garden. Hansa Teddy Bears and Animals. 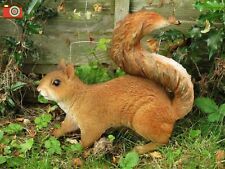 This Very Realistic Squirrel is Beautiful. Red Squirrel with Nut. The Reynard Estate Fox. Teddy Bears Animal Soft Toys. 'Toys that Teach'. Newborn Baby to Toddler Gifts. How to Iron on the Squirrel Patch. Remove the iron and allow the patch to to cool. Lift the towel and check to see whether the patch is fixed on securely by gently rubbing at the edge with a finger, trying to lift it. SQUIRREL GIFT SET. BOOKMARK SILVER PLATED APPROX 8 CM. SMALL KEY RING 7 CM. SENT WITH ORGANZA BAG READY TO WRAP. 13x14x6cm (5x5.5x3"). Sculpted by Adrian Tinsley. You Save £2.50. Vintage Squirrel On Tree By New Devon Pottery. By New Devon England Pottery. A Squirrel at the base of a tree. Height 8cm. 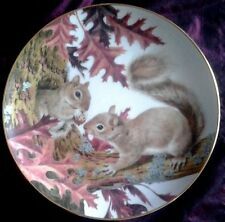 WEDGWOOD, RED SQUIRREL IN WOODLAND, circa 1980's. Stunning, Very Rare. THIS LOVELY PIECE IS HAND MADE AND HAND FINISHED IN THE UNITED KINGDOM. IT IS FULLY BACKSTAMPED ON THE BASE. WEDGWOOD PORCELAIN MADE IN ENGLAND. This Lovely piece RED SQUIRREL. RED SQUIRREL IN A WOODLAND SETTING, ACORNS ON THE GROUND, WONDERFUL! Kitten Heels. Design /Print: A Pretty Forest Squirrel in the Snow…. Snow Globes. The Reynard Estate Fox. Christmas Baubles. Christmas Collectables. Newborn Baby to Toddler Gifts. Bottle Opener. Vintage Miniature Hagen Renaker Red Brown Orange/Red Mama Squirrel Cute! Metal squirrel Figurine Napkin Holder? Or Something? TWO VINTAGE NILOAK ARKANSAS ART POTTERY FIGURAL SQUIRREL PLANTERS 1930"S ???? 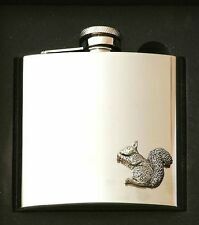 Vintage SQUIRREL ON HERALDIC TORQUE Horse Brass SQUIRREL LOVER! WOW YOUR WALLS!